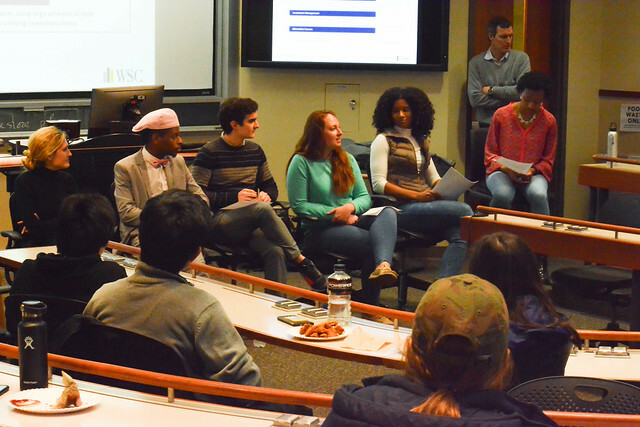 On March 27, over 40 undergraduate students from various majors and backgrounds attended a “Diversity on Wall Street” student panel. The attendees had the chance to hear from six student panelists involved with the Notre Dame Institute for Global Investing (NDIGI), the Wall Street Club (WSC), the Student International Business Council (SIBC), the Investment Club, and multiple cultural clubs. These panelists answered questions about their experiences with diversity opportunities, career discernment, and diversifying Wall Street. The panel opened with remarks by Kevin Burke, Managing Director of NDIGI. Burke share with the students an overview of the wide variety of career options available on Wall Street. He explained that employers were creating specific programs to help diversify the finance industry. Burke encouraged the students, especially the freshmen and sophomores, to apply to these opportunities because they offer a way to expose themselves to a rewarding career post-graduation, cultivate relationships with recruiters, learn about the different areas of the financial services industry. The “Diversity on Wall Street” Panel was designed to increase awareness of the many diversity programs and careers available to students of all years, disciplines, and backgrounds. The panel was moderated by Sorin Storytellers Intern, Irla Atanda '20, who also prepared the questions. Q: What programs have you been involved with that have helped spark and cultivate your interest in the finance industry? Arturo: Although I am a mechanical engineer, I knew that I was very interested in pursuing a career in finance. To learn more about what a career in finance would entail, I started getting involved with SIBC. At first, I simply attended these meetings, participated in a few projects, and learned from the other students involved. As my interest grew, so did my involvement. Now, I’m one of the presidents for SIBC. Sarah: I am also an engineer and realized that I wanted to use my technical knowledge in the finance industry. Like Arturo, I started going to the different clubs involved with finance, such as the Investment Club and Wall Street Club meetings. I think a lot of people feel like they don’t know enough to get involved with somethings, but even if you feel like you are not qualified, you should still apply to these programs and try to become involved with them. That’s what I did. You may be surprised as to how prepared you are. Q: How has the alumni network helped you through your career discernment and recruitment process? Sarah: As a chemical engineer, I used the Notre Dame alumni network to connect with engineers who were working in the finance industry. As I went through the undergraduate recruitment process, I didn’t want to close any doors too early, so I made sure to connect with as many people as to help discern how I wanted to use my technical skills in the investing world. Jaclyn: The Notre Dame alumni network has been a tremendous resource to me throughout my career discernment process. Alumni are always willing to speak to current students about their careers and help students network with their respective firms. Through this network, I was able to determine what career I wanted to pursue and find an opportunity at a firm of my interest. Q: How has the Notre Dame community helped you in your career discernment process? Will: After graduation, I will be a Financial Analyst for The Blackstone Group in New York. I think getting involved with SIBC, NDIGI, and the Wall Street Club really helped shape my career discernment. Through these programs, I got the opportunity to connect with a lot of upperclassmen who eventually became mentors to me. The most important thing to know is that the finance industry is an apprenticeship business. Jaclyn: Throughout my freshmen and sophomore years, I reached out to many upperclassmen that had experience in the finance opportunities I was interested in. I want to encourage all underclassmen to not be afraid of speaking to upperclassmen about their career discernment. As a senior, I am always happy to answer any questions any underclassmen might have. Q: Can you explain how you networked throughout your undergraduate careers and in what ways you think networking is important? Will: Networking is absolutely essential for the job recruitment process. It gives professional employers the opportunity to learn about you in a more casual setting. By networking, recruiters are able to determine if you will be a good fit for their firms. It is imperative that students develop strong, respectable networking skills. Brandon: For me, networking has become an everyday thing. I don’t like to think of it as networking because that term may intimidate people. Instead, I like to think of networking as a way of getting to know other people. I have always been an outgoing person. Networking has provided opportunities for me to get internships, specifically ones that help other minority students find opportunities that support their future success. Rather than thinking about networking as a way to reach out to employers via email or Linkedin, think of networking as an opportunity to be authentic. Q: How did you decide that you wanted to pursue a career in the financial service industry? Qai: As I became more involved in my career discernment process, I realized that there are so many opportunities in the financial service industry for non-finance majors. I remember applying for many opportunities. I encourage you to apply for all of the opportunities made available to you- especially if you are unsure of what you might want to pursue in the future. By applying for things, you discover things you didn’t know you were interested in and realize the things you are not interested in at all. Arturo: Coming into Notre Dame, I always knew that I wanted to be involved in the finance opportunities offered on campus. These opportunities helped me discern how I wanted to use my technical engineering knowledge in finance. I think it was important for me to avoid tunnel vision throughout the application and recruitment process. It’s very important that you stay open to cities besides New York, Chicago, or San Francisco. Be open to opportunities that don’t seem like your first choice initially and go on from there. Last summer I worked in Credit Suisse’s Mexico City Office and this summer, I will be returning to Credit Suisse as an Investment Banking Analyst in New York. Being open to any opportunity is an important step in the discernment process because these opportunities often lead to other opportunities. Q: Why do you think diversity on Wall Street is important? What diversity opportunities are there currently available on campus? Qai: As the president of the Black Student Association (BSA), I am always trying to connect students in the BSA with diversity opportunities available. For instance, I am an Ambassador for the Jumpstart Advisory Group, a company that helps unlock the full potential of young professionals and create long-term success by connecting employers with exceptionally qualified diverse candidates. I am always making students aware of the opportunities Jumpstart has to offer. Brandon: Increasing the diversity on Wall Street creates a workplace that allows employees to perform better. I personally am very involved with the National Association of Black Accountants, Inc. (NABA, Inc.). Organizations like NABA help provide resources for students of diverse backgrounds build and manage their career trajectories. Panel events assist in creating an environment where students can learn about the plethora of opportunities available on campus and in the financial services industry. “These students are leaders in the Notre Dame community and are committed to preparing underclassmen in accessing intellectually stimulating careers on Wall Street. In addition to participating in panels, such as this one, these student leaders help prepare the next generation of students by volunteering in a variety of activities such as hosting mock interviews, reviewing resumes, providing valuable insight in the internship process and leading and evaluating case projects,” said Mary Scott, Associate Director at NDIGI.